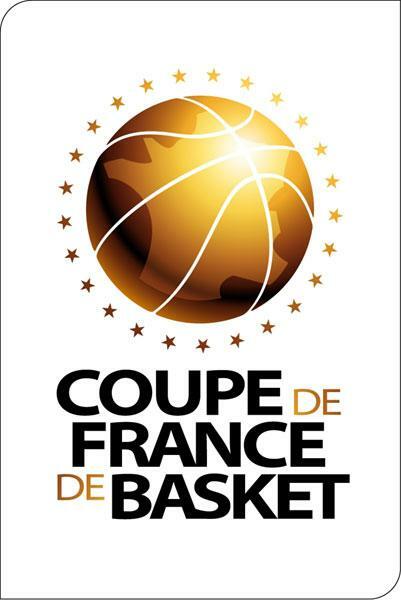 Tarbes have qualified for the final of the 2009 edition of the Basketball Coupe de France (French Cup) after beating Aix-en-Provence in the first semi-final (68-57). Isabelle Yacoubou-Dehoui was the player of the match with 22 points and 19 rebounds. Tanisha Wright contributed 16 points and dished out 5 assists while Tarbes’ captain Liz Moeggenberg contributed 13 points in the victory. For Aix-en-Provence K. B. Sharp and Hollie Grima scored 14 points each. Playing in the final of the basketball Coupe de France final in Paris has become a recent tradition for Bourges Basket and 2009 will be no different. They qualified to defend the "trophée Joë Jaunay" also known as the French Cup after beating Villeneuve d’Ascq (55-49) in the second semi-final. Cathy Melain led the Bourges attack with 15 points and 3 assists which included 3-of-4 from beyond the arc. Katrina Manic also scored 3-from-4 three-pointers in her total of 13 points. Jolene Anderson led the offensive with 17 points for Villeneuve. But it was not enough to prevent the defending champions from winning. Isabelle Yacoubou-Dehoui made her presence felt straight from the tip-off and was quickly at the foul line to score 2 free-throws. Both sides missed their first few attempts before Tanisha Wright doubled Tarbes' advantage with the second score of the match. Tarbes quickly got into their stride and with treys by Yacoubou-Dehoui and Liz Moeggenberg to lead (14-4) with a little over five minutes played. Erik Lehmann, the coach from Aix-en-Provence, called for a time-out to break Tarbes' rhythm. Yene Séné went on a charge to the basket and scored as well as picking up the free-throw. However this was as good as it got for Aix as Wright and Yacoubou-Dehoui (9 first-quarter points) continued to score at will as Tarbes won the first period (26-17). Things did not improve for Aix as veteran Polina Tzekova scored 5 quick points to put Tarbes in the driving seat early in the second quarter. Aix were forced to chase the game but were unable to bring down the score and went into the break trailing (23-37). Séné and K. B. Sharp fought tooth and nail for Aix-en-Provence during the third period but were powerless to stop Wright and Moeggenberg from Tarbes and went into the final period trailing (39-52). 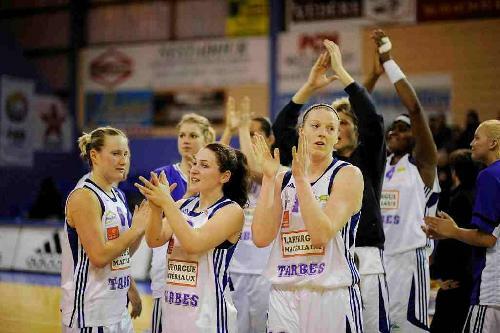 Aix did all they could to trouble their opponents as they took advantage of the poor finishing of Tarbes. All the same it required a three-pointer by Frida Eldebrink for Tarbes to finally break the resistance of their opponents as they went on to win (68-57). Villeneuve d’Ascq went on the attack from the start against Bourges Baskets with Fatimatou Sacko and Jolene Anderson hitting three-pointers for a (6-0) start. Bourges were able to get things going through Alessandra Santos and Nwal-Endéné Miyem. But they struggled as Lady Comfort and Géraldine Robert went to work in the paint for Villeneuve to lead (14-7) by the end of the first period. With Céline Dumerc not having any luck offensively, Cathy Melain's (left) experience kept Bourges on the tail of their opponents. The second period was played at a quicker pace and once again the three-point shooting of Jolene Anderson made the difference as Villeneuve went into the interval leading (32-24). Anderson was leading all scoring with 13 points at the break. Bourges were a different team after the break and went on a 10-0 run with Emméline Ndongue and Katarina Manic doing most of the damage to go ahead for the first time in the match (34-32). Sacko ended Villeneuve's barren spell after almost six minutes played in the third quarter to regain the lead. The intensity picked up as both sides fought for every ball and the two teams went into the final period level (39-39) after Melain intercepted a pass and drove to the basket to finish with a lay-up. Anderson continued to cause Bourges problems and added 4 more points to her tally as Villeneuve led (43-40) early in the final quarter. Bourges Basket were forced to step their game up to another level and went on a three-point festival with Manic, (right) Dumerc scoring twice and Melain once as they held their nerve to win (55-49).